Whenever my friend Brian and I go fishing for halibut out of Juneau, we always get so many laughs out of the whale-watching tour boats. They motor in erratic circles around the bay like drunken drivers, chasing distant humpback spouts, and when they finally see a tail or a piece of fin, everyone rushes to one side of the boat and erupts in a loud chorus of oooooooo's. Yeah, those silly tourists, they sure are funny. 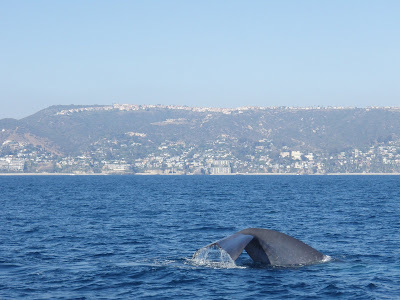 So funny that I debated whether or not I was ever going to admit to climbing onto one of those silly tourist-clogged boats to take a whale-watching tour out of Dana Point. But when I walked away with one of my coolest wildlife encounters, well, ever ... I decided it was probably worth taking a little ribbing from my Juneau friends. 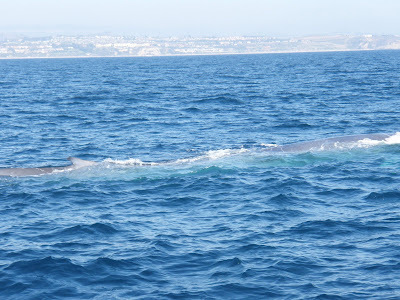 We saw a couple of blue whales, estimated to be 60 and 70 feet long, respectively (two of the largest animals that have ever lived!). Blues, as far as I know, don't come anywhere near Juneau, but they don't seem to have any qualms about approaching silly tour boats. This one just lulled atop the water for a long time, spouting occasionally and briefly dipping under the water. It was so close to the boat that I couldn't even capture the full length of it with my camera lens, no zoom required. The tour guide, unable to determine what the whale was doing, finally just announced that it was probably asleep and we were moving on. But the really surreal experience came later, when we were heading back in, sun-fatigued and half napping on the benches. A little girl walked up to the captain and announced she wanted to see dolphins. 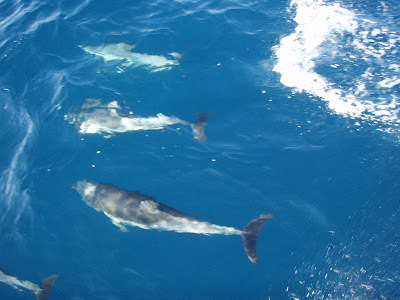 The captain just mumbled something about "we'll see what happens," and not five minutes later, the boat floated straight over a pod of 500 or 600 dolphins. They were shooting out of the water on all sides of us like salmon in a waterfall, a kind of rolling dance almost synchronized to the bounce and clap of the boat. A dozen or so locked on to our wake and swam right below the boat, like they were racing us, and we tourists just hung over the railing, gazing into the cerulean water and quietly wishing we could join them. Now I've seen wolves in the wild, grizzly bears within feet of the trails I was riding and black bears in the Utah desert. I've seen moose and caribou and bighorn sheep and mountain goats way out in the wilderness where few humans venture. I see all kinds of marine mammals on routine bike rides and more eagles than I could ever count. But I have to say, those dolphins really did it for me. I can't help that I was on a commercial tour boat in Southern California. I live in Florida and we see dolphins frequently from the shore as well as while in the boat and I am NEVER not amazed and I always feel that I've been given a special blessing when I see them. There is something so special about those smiling, playing dolphins. No need to apologize for playing tourist! Having lived in multiple tourist epicenters throughout my life, I know the smirky feeling you describe. Tourists can be so stupid and when you're in the service industry catering to goobers whose reality comes from TV and whose wild animal savvy was honed at Disney World, you can't help but make up funny nicknames for them while taking pride in getting the locals discount for yourself. But the real goobers are those that are too cool to partake in the very sights, tours and overlooks that the vacationers traveled to see. I was just in Seattle could not get enough of the marmots and chipmunks! Whenever I see people looking at alligators I always wonder what the big deal is. If you have never seen something before, it's cool when you do. A friend was googling me, and came across you. I used to live in Alaska, and she wondered why I moved back and didn't tell her. As much as I dislike the term "tourist" ... been there done that. There is nothing wrong with it at all. You only live once and however choose to see the world is up to you. People that have the "You're a tourist," attitude are asses. I say... be a tourist and see the world anyway you see fit. I don't get why the term "tourist" is such a big deal or why it's even used by those of us who like to see the wild in a more "rough it" type setting. I guess we're elitist and that's too bad for us. what a great experience it must be to witness something like that! 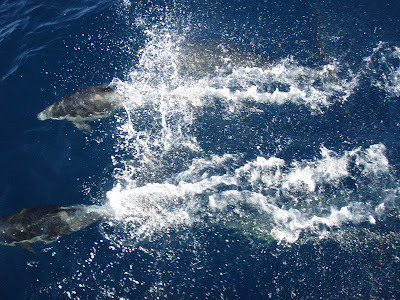 Loved the dolphin photos - one of my favorite creatures. I would have been the person going "ooooo"
Just got back from hawaii and it was amazing the deep blue sea i really need a deep sea fishing boat because my Sevylor aint going to cut it.